This chapter deals with the new digital environment that embraces newspaper content. The notions of newspapers, news, articles, photographs, cartoons and podcasts are considered. The legal notion of the entitlement of creators’ rights in different newspaper contents (journalists, photographers, cartoonists, visual artists), the legal implications due to contractual arrangements and the status of rights in case of an employment contract and in case of a services contract are analyzed from the copyright perspective. 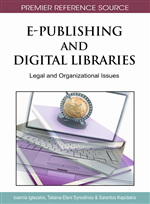 The chapter answers the question who owns the electronic rights in the newspapers contents. It considers the exceptions and limitations of copyright, the fair use principle and the three-steps test. Lastly, it deals with the undisputed modern reality of digital libraries with newspaper content and digital libraries of general cultural content and defines the unique characteristics of works included in newspapers. It concludes that, while international and national legislators acknowledge the social request for a more free access to technical and educational materials, copyrights are to be respected. Printed newspapers have been for centuries the most popular source of information for the public and a feature of democracy itself, connected with the freedom of expression of people, political parties, social and financial groups, scientists and artists. Even after the introduction of broadcasting technology, newspapers remained very important as the primary source of news, notwithstanding that nowadays people often rely on television newscasts for their daily update of current events. Nevertheless, newspapers still greatly influence the “formulation” or the expression of public opinion by providing the necessary podium for journalists to express their personal views and to analyze political, economical, business, or cultural events.